The really short answer? Its about learning and exploring mathematics via math related games, riddles, and puzzles….but the activities could have you going for hours, days, weeks, or longer! 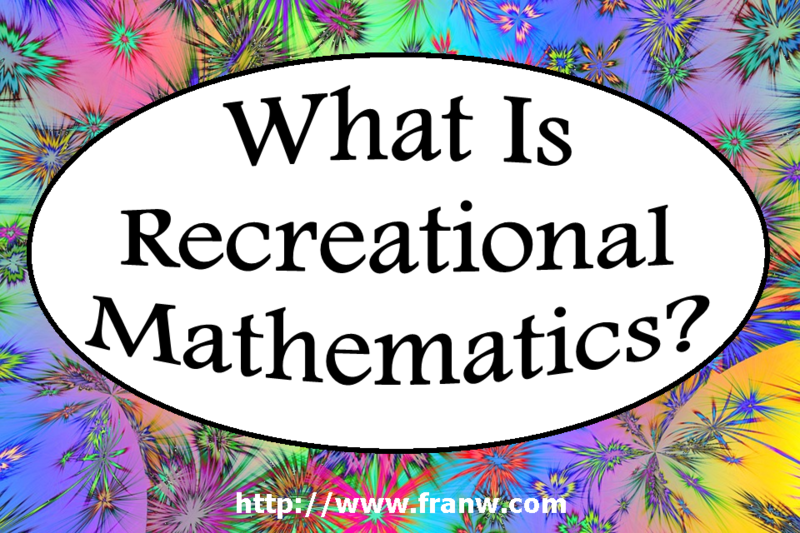 Wikipedia: Recreational Mathematics – Explains what recreational mathematics is. Scientific American: A Quarter-Century of Recreational Mathematics – PDF Article written by Martin Gardener about 25 years of amusing puzzles and serious discoveries. MathOverflow: Recreational mathematics: where to search? – MathOverflow is a Q & A site for professional mathematicians. This question came up and offers a few responses. Access back issues for FREE by putting the date and issue you want to look at into the panel on the right that says, ‘Magazines Available’. You’ll get a version you can view online and print. Read book reviews of published books on recreational mathematics. Subscription needed to access information. Check your local book store and online book stores for books that contain math related games, riddles, and puzzles.